"The NobleStitch did exactly what I hoped it would. I had my energy back as soon as the anesthesia wore off- John Wyall." John Wyall from Orem, Utah has suffered from stroke, aura, and severe chronic fatigue that has worsened in the last few years to the point that he has been bedfast for 14 to 18 hours a day for the last year and a half and unable to do much more than sit on the couch when he was able to get out of bed. After trying to get answers from numerous doctors over the years, he finally found a specialist who discovered through tests that he had a PFO or “Patent Foramen Ovale,” a condition in which the tunnel between the left and right side of the heart did not close shortly after birth. This is a condition that exists in more than 27% of the population, but not everyone’s defect is severe. 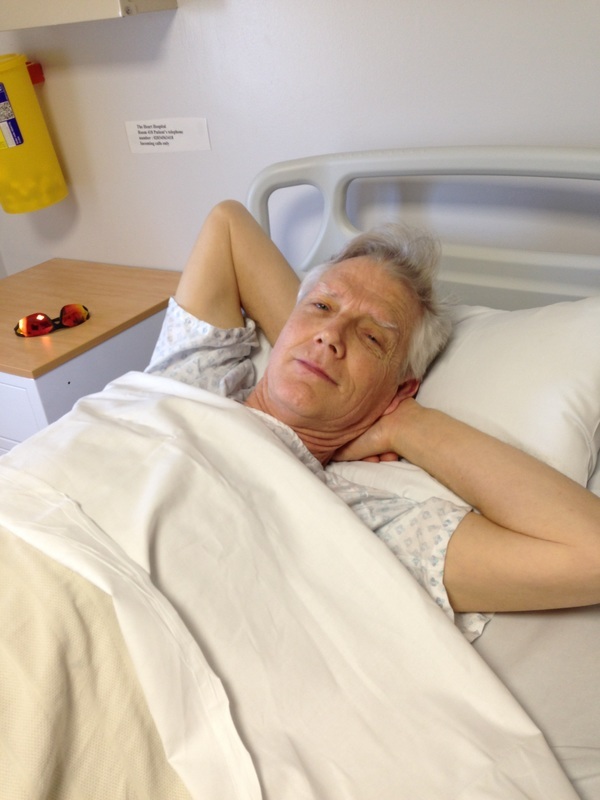 It was clear to John that he needed to have his PFO closed, but he was told that he would need to have at least 2 strokes before he would qualify for treatment. He had already had one stroke and numerous mini-strokes, and waiting to have another one was unacceptable to John. He began his research. The only approved procedure for PFO closure in the US was open-heart surgery. This is a very traumatic procedure that requires general anesthesia and having the heart stopped while on a heart-lung machine. This was not the option John was looking for. John had found in Europe that there was a percutaneous solution that did not require open-heart surgery. However, it required leaving a couple of large metal discs in the heart. There were also some very dangerous potential risks associated with these discs that John did not want to take. He discovered a new technology called NobleStitch, which was developed by well-known medical device inventor Prof. Anthony Nobles. John then reached out to Dr. Michael Mullen, Consultant Cardiologist at University College Hospital London, UK and a member of the NMT2 Clinical Advisory Board who has performed more of the NobleStitch procedures than anyone in the world, and asked if he could perform the procedure on John in London. Prof. Nobles flew to London to meet John and his wife and to be on hand with Dr. Mullen. Dr. Mullen successfully placed the suture in John’s heart and achieved a perfect closure using the NobleStitch. The entire procedure took less than 20 minutes, and even with what is considered to be a large PFO, a single suture did the job. "Now, I hope that I can live fully with working, traveling and physical challenges. To be free from the medication with Warfarin and the feeling of being afraid of a new stroke means a lot to me." Swedish patient Eva has had a successful PFO closure. The patient, a nurse/ administrator from the hospital and rehabilitation center in Linkoping, who has suffered from stroke and migraine was being treated with aggressive medication Warfarin (a strong anticoagulant) and Simvastatin while awaiting closure of her PFO. Eva and her physicians investigated the cause of her stroke and found Eva suffered a cryptogenic stroke, i.e. there were no vascular disorder or any other explanation for the stroke. During an ultrasound examination of the heart they found a PFO (Patent Foramen Ovale), which they believed was the reason for Eva’s stroke. PFO is a condition in which the tunnel between the left and right side of the heart did not close shortly after birth, which leaves the tunnel for clots to pass from the right to left side of the heart bypassing the filtration of the lungs. This is a condition that exists in more than 27% of the population. Eva was scheduled for PFO closure with a large metal umbrella type implant that would remain in her heart for life and require potentially long term anticoagulation therapy and carry some of the known risks associated with these implants including migration, erosion and perforation of the structures of the heart. This led Eva to investigate alternative treatment. Her cardiologist Dr. Niels Erik Nielsen recommended a new device from America, the NobleStitch EL. Initially apprehensive to be the first in Sweden until Eva saw an interview with Prof. Nobles showing the NobleStitch device and then specifically requested the NobleStitch EL to treat her PFO. It was clear to her Physician Dr. Niels Erik Nielsen, Cardiologist at the Linkoping University Hospital in Sweden that she needed to have her PFO closed. Because she had already had a stroke and did not want the usual type of implant in her heart. Dr. Nielsen also believed their was a better solution required for her and his other PFO patients and having discovered the NobleStitch a year prior at the Structural Heart meeting “CSI” in Frankfurt. He began his research and contacted Prof Nobles at the congress and received initial training on the NobleStitch. Dr. Nielsen believed that the NobleStitch would be the best device for her rather than the metal disc implants, which required leaving a couple of large metal discs in the heart as there were some potential risks associated with these discs that Dr. Nielsen nor his patient wanted to take. The NobleStitch enters percutaneously through the vein in the leg and travels into the heart under fluoroscopy (X-ray) and places a suture in the PFO to close the hole. This is the same suture that is used in the open-heart procedure, but without the surgery. Dr. Nielsen contacted Nobles Medical to see if he could get the NobleStitch for this procedure in Sweden. After speaking with Prof. Nobles, CEO of NMT2, Prof. Nobles planned a trip to Sweden as part of the initial sales launch in Sweden and to train Dr. Nielsen on the NobleStitch EL. Dr. Michael Mullen, Consultant Cardiologist at University College Hospital London, UK and a member of the NMT2 Clinical Advisory Board who has performed more of the NobleStitch procedures than anyone in the world, flew to Sweden to proctor Dr. Nielsen who successfully placed the suture in Eva’s heart and achieved a perfect closure using the NobleStitch. The entire procedure took less than 25 minutes, and a single suture did the job.